In August 2008 together with a group of French doctors and Russian scientists we visited Peru. The aim of the expedition aside from visiting splendid landscapes and historical sites of this wonderful country was registration of energy state of participants and their reactions to the change of atmospheric pressure with altitude (from see level up to 4000 m/13000 ft) and reactions to the shamanic ceremonies. gone. I do not think it was the influence of any supernatural forces. Batteries discharge much faster at high altitude, there is no electricity at Amante Island and the only source is the solar battery in the house of the island chef, but it operates only in daytime. So we had to miss this stage of measurements. 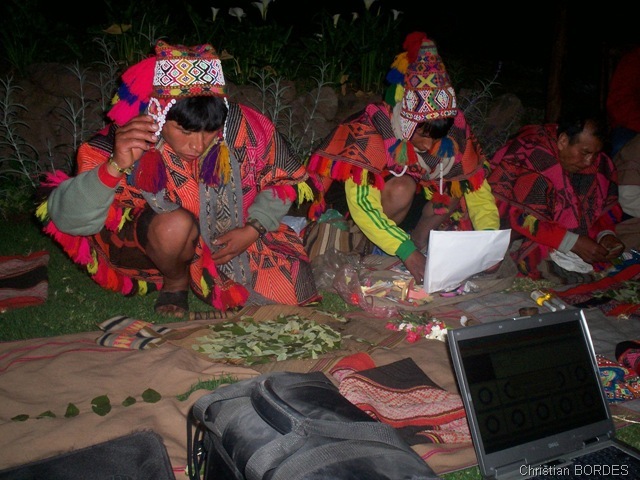 Second shamanic ceremony was held at the bank of Urubamba River nearby Kusko. At night all the members of expedition gathered at the picturesque place nearby the river and after some time arrived four shamans in colorful red ponchos and wool hats. Everybody sat around, one shaman took a reed and wistful melancholy melody glided in the air. During the ceremony shamans used a lot of coca lives. These lives have nothing to do with drugs. For cocaine production is necessary to use quite complicated technological process extracting active ingredients from hundreds of kilos of lives. Every participant was given a pinch of lives, we had to think of our wishes, and return lives to shaman, who fiddled with them and then burned out in a little fire singing a song to supreme deity Viracocha. This time equipment operated without complaints. I place the GDV Compact camera, laptop and antenna sensor just before the shamans and turned on an automatic mode. But after half an hour I have found that the computer hung. I had to re-start the computer and proceeded measurements with a new file. fumigated everybody with coca lives smoke, and then people embraced each other confessing in love. By approaching to the end of ceremony double rings were less and less apparent and after a time images became practically normal. We do not have any hypothesis explaining physical processes which may be responsible for this phenomenon. Ceremony was held at the open air, temperature was about 200С/700F with light wind. So it is unlikely to have the influence of some gases from the burning lives or breathing of 20 people. In the first part of the ceremony shamans burned the lives as well, but this had no impact on the images. ceremony. Arrow indicates the time line. Fig.2. Time change of Entropyand Area during the ceremony. The longer line corresponds tothe first part of the ceremony. further research in this field.